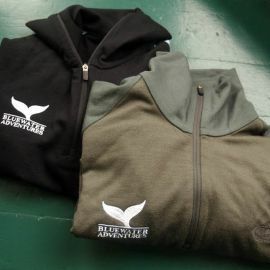 Bluewater gear makes great gifts for friends and family, or a wonderful souvenir to remember your trip by. With limited storage space for merchandise on the boats, we try our very best to maintain a variety of sizes and products for all of our guests. To ensure you come away with the correct size and style, place your order online and have your merchandise shipped within 5-10 business days so long as we have your item in stock. During a trip, the crew will bring out all of our gear to show everyone. If you are interested in purchasing something from our selections or simply want to see what is available, ask your crew and they will be happy to show you the samples of what we have to offer. If there is not the correct sizing onboard during your voyage, you can always place on order in our office when you get back. Warm, comfortable, durable and breathable! And if that isn't enough, they are also odour-resistant. 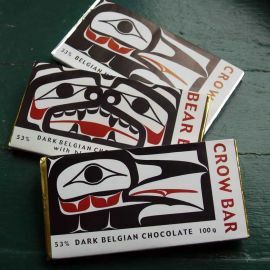 The Crow and Bear designs that are carved into these delicious chocolate bars, crafted on Saltspring Island, was created by renowned Haida artist Jim Hart. 3 Flavours to choose from - Milk chocolate, Dark Chocolate, and Dark Chocolate with Blueberry. By Andy Wright. 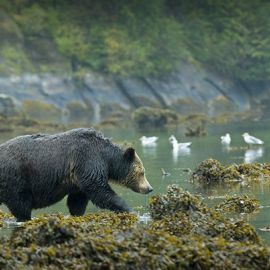 This spectacular book of photographs includes images of grizzly bears, kermode bears, whales, and Haida poles. All of the images, including the one shown here, were taken on trips with Bluewater Adventures. This makes a great coffee table book. This book brings the incredible scenery of the Great Bear Rainforest to life and has been instrumental in the efforts to protect this area. 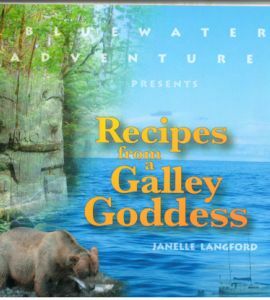 Complete with the area familiari, this book is a must-have for anyone whose been to the Great Bear Rainforest, or would like to go. All proceeds go to Pacific Wild. "...And after a mind expanding experience with a grizzly bear or a humpback whale off the coast of Haida Gwaii you will arrive in the salon ready to devour any one of my culinary creations from the galley. All is well in the world when the humpbacks start breaching at the bow and there are fresh baked muffins to enjoy on deck. Play, explore & prepare yourself for a feast of fresh flavours..."